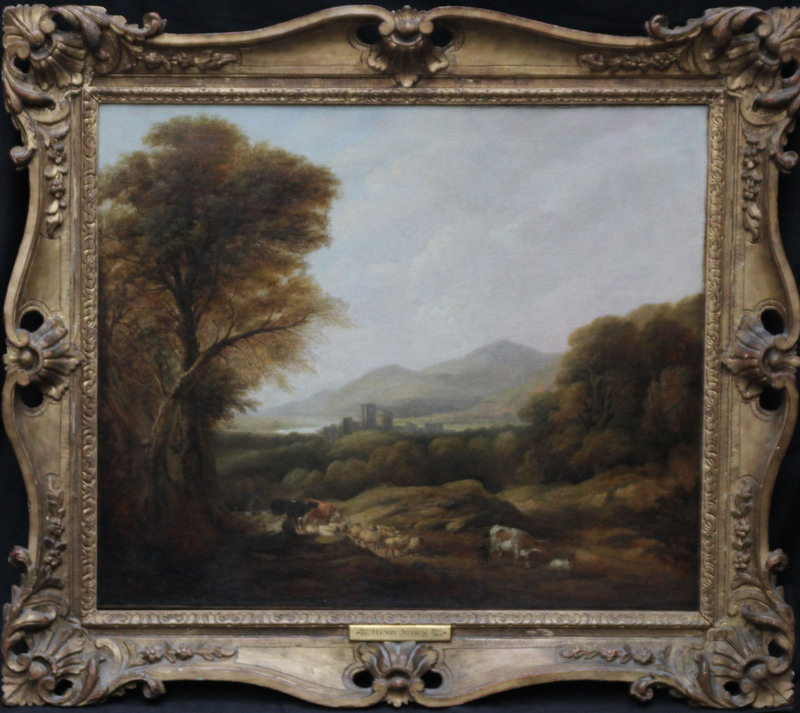 This gorgeous oil on canvas Victorian Old Master painting is by British artist Henry Jutsum. Painted circa 1850 the painting depicts a drover on horse back bringing up the rear behind cattle and sheep. Set in a magnificent landscape there are castle ruins and a lake in the background with mountains behind. There is superb colouring and detail making this a really attractive painting. Signed lower right and name plate on frame. Housed in an ornate gilt carved 19th century gallery frame 40 inches by 35 inches and in good condition. Henry Jutsum (1816-1869), was an English landscape painter. Jutsum was born in London and educated in Devonshire. There he acquired a taste for landscape painting, and on returning to London to further his art studies, he drew from nature, frequently in Kensington Gardens. In 1830 he became an apprentice to artist James Stark (of the Norwich School of painters). 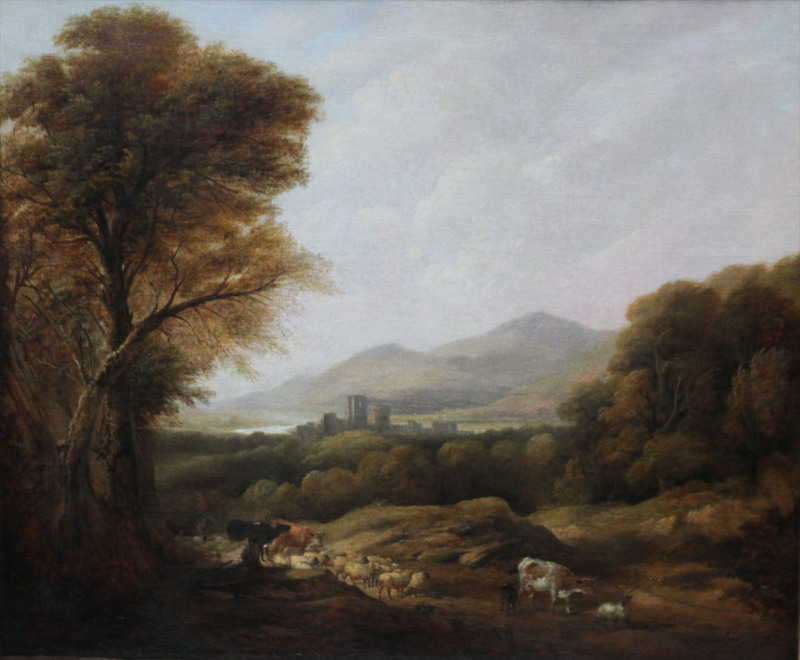 He first exhibited at the Royal Academy in 1836 and also showed work at the British Institution. He devoted himself for some time to watercolour painting, probably because of the influence of the work of J S Cotman (an important Norwich School artist), and in 1843 was elected a member of the New Watercolour Society. He continued, however, to exhibit at the Royal Academy, and preferring painting in oil, eventually resigned his membership of the Watercolour Society. He was a frequent contributor to the chief exhibitions up to his death, and his works were always greatly admired. "The Noonday Walk" in the Royal Collection was engraved for "The Art Journal"; "The Foot Bridge" is in the Victoria and Albert Museum. Jutsum was also an associate of painter Henry Bright. Jutsum died in London in1869, aged 53. Many of his own drawings in his possession and others collected by him were sold by auction at Christie's on 17 April 1882.